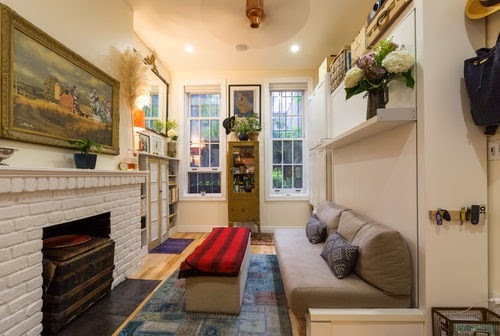 Back in 2014, I came across this tiny apartment on Refinery29. 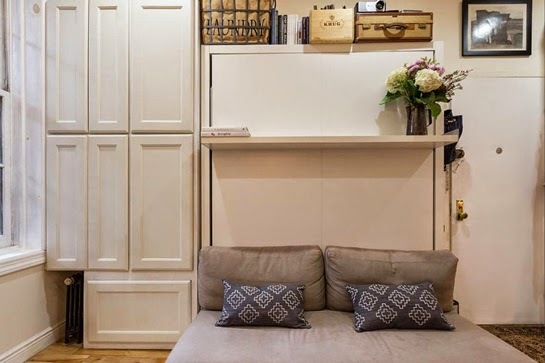 I loved it right away because it shows that small-space living doesn't have to be minimalistic or impersonal. Today, I saw that the very same apartment is now for sale (for more than half a million dollars!) 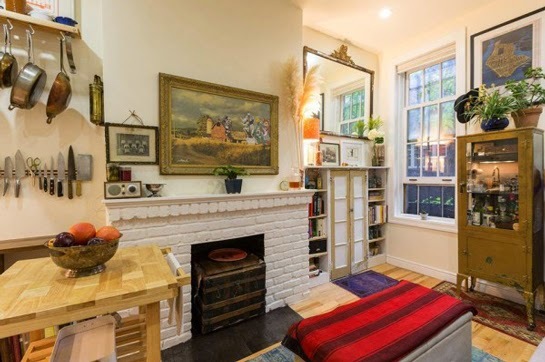 Of course, like any apartment for sale, the place has been staged with fewer belongings for an airier look. I thought I'd repost it here as a reminder that small does not have to mean minimalist. 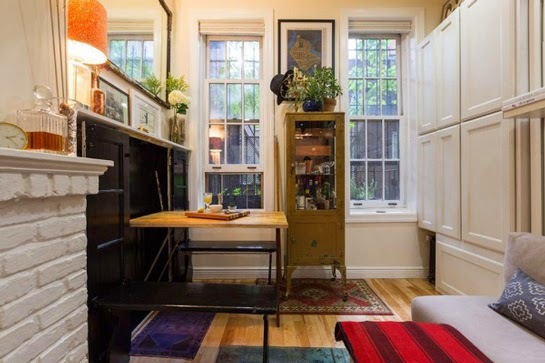 This apartment, which was also featured on Curbed.com at the time, really feels like someone's personal home—filled with antiques, collections, and art. The "bedroom" and "dining room" both fold away. This view of the living room shows the apartment with the Murphy bed and the dining table both folded away. It looks a lot like any New York City apartment's living room to me, which I like. See the Murphy bed unfolded below. Here you can see the Resource Furniture bed folded down (I'm not sure what model it is). I have said it once, and I'll say it again: Murphy beds are amazing. They clear up tons of floor space during the day, and they are as comfortable to sleep in as a regular bed (I swear!). It's like gaining an extra 30 square feet. Above you can see how close the kitchen is to the living space—close! In the right-hand corner the cabinet doors hide the dining table. And here, you can see the table folded out; on the right are additional storage cabinets. Clever, right? This shot is looking from the "living room" towards the kitchen. 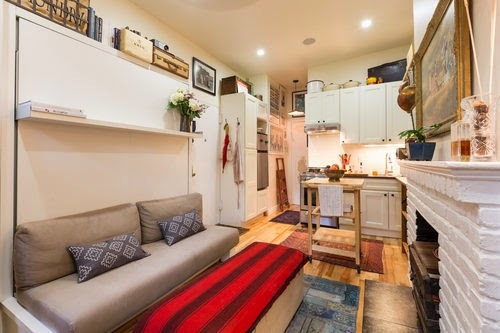 If I were to do one thing over in this apartment, I would have suggested they run the cabinets straight up to the ceiling like we did with our small kitchen remodel. Not having pots stacked on top of your cabinets really streamlines the look of the kitchen--and you wouldn't believe how much extra storage space you feel like you have. 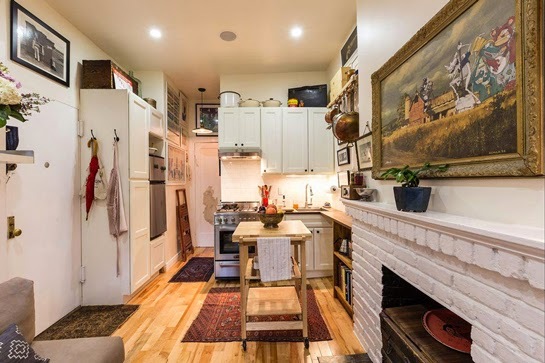 I love that the couple splurged on a nice stove (with what looks like a fancy, little exhaust fan at the back! ), even though their kitchen is teeny-tiny. 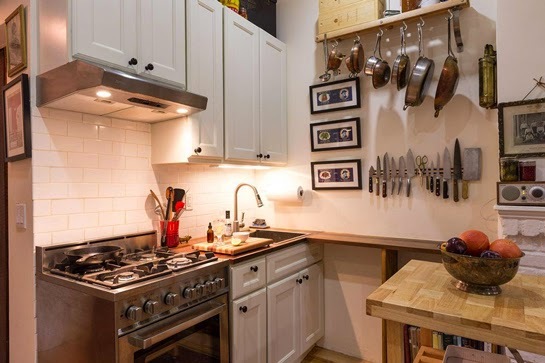 The close-to-the-wall pot rack, magnetic knife block, and wall-mount paper towel holder all make up for lack of drawer and counter space. Lastly, looking straight on at the Murphy bed with the bed folded away with storage on the left. 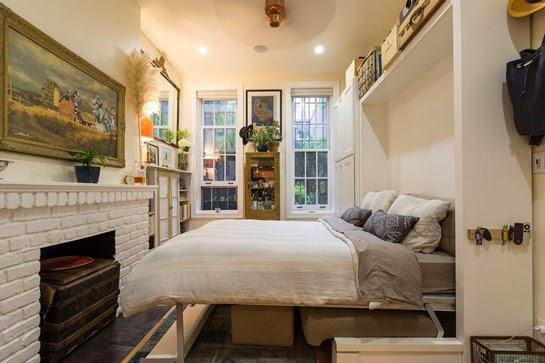 Update: LifeEdited also posted about this tiny home and included a great overall room shot here. I love the ideas you've shared! 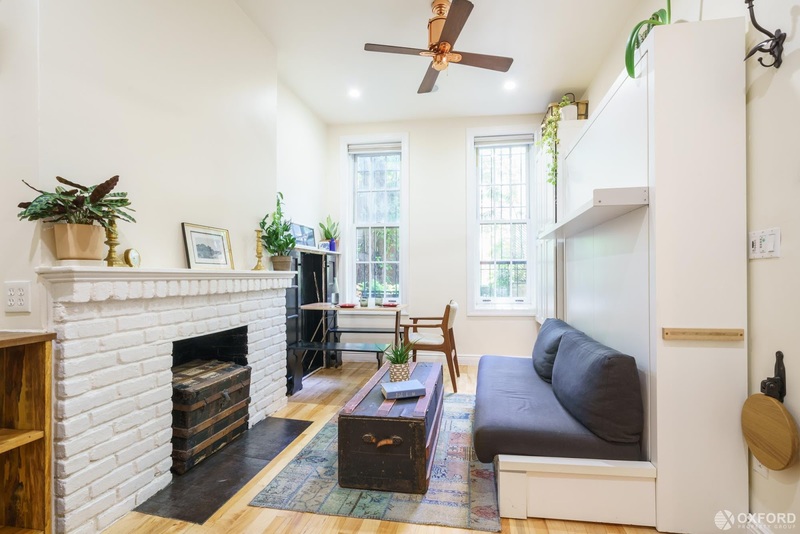 I'm going to renovate my apartment this spring and this post is getting bookmarked for future help :D Thank you for sharing it! You're welcome! I hope you'll check out other posts, as well.